Obesity and its link to cancer – what do we know, and what can we do? You are here: Home / Blogs / Obesity and its link to cancer – what do we know, and what can we do? Many of us will remember a time when it was commonplace to take home the lingering smell of cigarette smoke after spending the evening in a restaurant or pub. Now, thanks to the ban on smoking in public places, clean air is the norm and most of us wouldn’t tolerate sitting in a toxic fog-filled room. While the fight against tobacco is far from over, there is also another killer threatening the health of the nation – obesity. Scotland’s levels of obesity are the worst in the UK and we are among the heaviest nations in Europe. 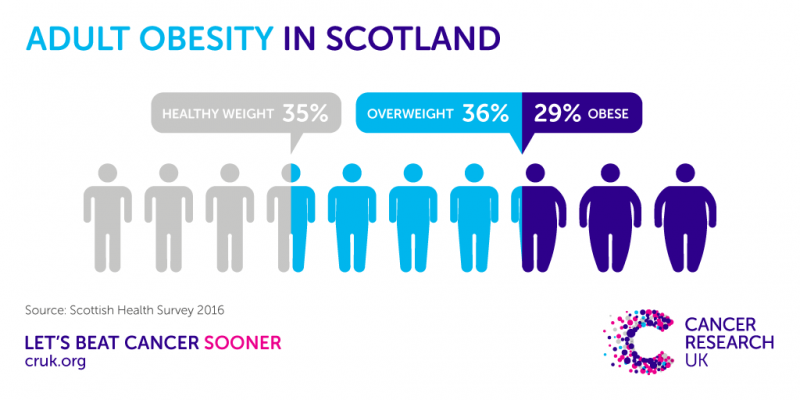 As an adult, it is now more normal to be overweight or obese in Scotland than it is to be a healthy weight. While if you look around any primary school playground in Scotland, you can expect to see more than a fifth of the children there carrying too much weight. Not only does this have major implications for the health of our nation, but it also mounts up to a crippling burden on the NHS, with the economic cost of obesity to the NHS reaching an estimated £600 million a year. And in the same way that Scotland changed its attitude to smoking in public places after the smoking ban, there is an opportunity to rethink the way we all look at our diet. At Cancer Research UK, we were disappointed with the UK Government’s childhood obesity plan which was published last year: it didn’t go far enough to make a significant difference. So we believe the Scottish Government can and must go further. The Scottish Government knows obesity is a problem and is currently considering how it will tackle this scourge on our society. In the coming weeks, we expect to see the Scottish Government publish a public consultation on its Diet and Obesity Strategy. And at Cancer Research UK, we think this forthcoming strategy is a once in a generation opportunity to introduce measures that will have a profound impact on our lives, and the lives of our children. After all, an obese child is around five times more likely to be an obese adult, storing up health problems for their entire lives and placing them at risk of preventable cancers. Obesity is the single biggest preventable cause of cancer after smoking in the UK and is linked to 13 different types of cancer. We also know that if current trends continue, rising numbers of overweight and obese adults could result in 670,000 avoidable cases of cancer across the UK over the next 20 years. Surely this tells us it really is time to take action. Cancer Research UK is clear that one of the most effective measures the Scottish Government can take to curb the rising tide of obesity is to restrict the array of multi-buy offers on unhealthy food that supermarket shoppers are routinely faced with. Walking around the supermarket aisles, we’ve all seen the bright labels enticing us to stock up and buy more than we need – two chocolate bars for a pound, three multi-bags of crisps for £3. In fact, according to our recent calculations Scots are stocking up on around a whopping 110 tonnes of sugar from unhealthy food and drink bought on special offers every day. It’s a skilful marketing ploy that’s hard to resist and it is causing families all over Scotland to fill up their trolleys with excessive amounts of junk food. And of course price does matter. Studies have shown that the most deprived in our society consume the fewest fruit and vegetables. They also consume the highest amounts of sugar, processed meat products and chips. Scottish households also have the biggest thirst for fizzy drinks, spending over a quarter more than other UK nations on soft drinks. We buy what we consider to be good value for money and much more needs to be done to make healthy options affordable. We also know it’s not enough to simply encourage people to do more exercise – research shows us you can’t run off a bad diet. The food we eat is central to good health and emphasis must be placed on supporting parents to provide a healthy diet for their children. Cancer Research UK believes the nation’s poor health justifies strong action. Restrictions on supermarket price promotions on unhealthy foods would be effective and feasible. By making junk food more expensive and rebalancing promotions towards healthier options, we’ll be taking home smaller waistlines, healthier lives, as well as bags of tastier, fresher and more nutritious food. We want to help give children the best start in life, and reduce their risk of developing cancer in their lifetime. Measures to help us enjoy a better diet will make it easier for us all to stack the odds of not getting cancer in our favour.